An \"Uplifting\" experience! Walkaroo Balance Stilts Xtreme for advance stilt-walking quickly adjust to accommodate anyone from 4' 6" to 6' 6" (ages 6 and above). 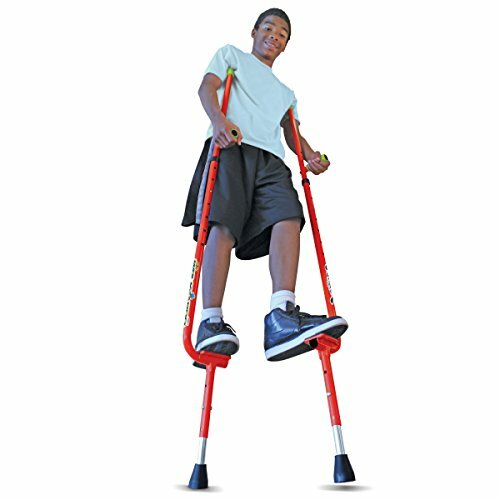 What makes them \"Xtreme?\" It's the adjustable walking height that takes you from the height of Original Walkaroo Stilts (5\" off the ground), WAY UP when you attach the included VERT LIFTERS. These Extensions allow experienced stilt walkers to walk even higher! They can be adjusted from 12 inches to a super-hight 17 inches off the ground! Geospace has made the classic stilts design a whole lot better... a whole lot easier to learn, easier to use, more ergonomically correct, and much more FUN! Traditional stilts are simply straight poles with foot platforms attached to the sides. Unfortunately, the tops of the poles rest uncomfortably behind the shoulders, which forces the upper body to slump forward and hinders balance. Not ours! Only Walkaroo Stilts have a patented \"S-bend\" which wraps comfortably around the back of your shoulders. Another bend at the foot platform places your weight directly over the lower pole for vastly improved control. Great for improving balance and coordination. Made of rugged tubular steel, with a non-marking rubber \"foot,\" which allows for use indoors and out. Steel construction. For ages 6 years & up (to a maximum of 250 Lbs). Package Dimensions: 37.5" x 7.75" x 3.5". Want Walkaroo Xtreme Stilts in GREEN? Search for: Walkaroo Xtreme Steel Balance Stilts with Height Adjustable Vert Lifters by Air Kicks, Green.